I’m back home after a great weekend with my volunteer “family.” Despite my late-night packing habit, I wasn’t too much of a zombie, and I had almost everything I needed. I brought along a scaled-down version of my natural medicine cabinet but neglected to include my peppermint essential oil, which was a shame because nearly every member of our party experienced some degree of intestinal discomfort at some point during the trip. I am kicking myself for forgetting the peppermint! I had orange with me, which is helpful for digestive issues, but doesn’t hold much of a candle to the power of peppermint. Lesson learned. I unpacked last night, got a good sleep, and now I’m ready to get my week started as I continue adjusting to a new schedule. I’m now a long-term sub for the teacher’s assistant at a preschool where I used to work, so I get to spend my Tuesday and Thursday mornings with some 3- and 4-year-old darlings and their sweet teacher. It looks like they may need me until the end of the year, but we’ll see. I’ll just help out until they don’t need me anymore! This week’s passage is Matthew 4:18-20, and the Seeds song is “Fishers of Men,” track 10 on “Seeds of Purpose.” The song uses the NIV 1984 translation, but the verse below is from the ESV. 18 While walking by the Sea of Galilee, he saw two brothers, Simon (who is called Peter) and Andrew his brother, casting a net into the sea, for they were fishermen. 19 And he said to them, “Follow me, and I will make you fishers of men.” 20 Immediately they left their nets and followed him. This is such a cool verse. I love the glimpse into the very beginning of the disciples’ relationship with the man whom they would later discover was God’s Messiah. Peter and Andrew were not the coolest, smartest, or most accomplished kids on the block, and they were probably stinky from all the saltwater and fish, but a “rabbi” singled them out to teach them, mentor them, and prepare them to introduce the world to the good news of God’s salvation for all who believe. This verse is also great because it shows an immediate response to Jesus’ call. I tend to make an obedience connection when I read verse 20, but I’m wondering about that connection as I try to articulate my thoughts on this passage. To look at the passage grammatically, sure: “Follow me” could be considered a command. But looking at the words all together in context, it seems Jesus is giving more of an invitation or an offer. So when the brothers leave immediately, are they obeying… or are they simply accepting the offer and the one who gave it? The more I think about it, the more I think it is the latter. Rather than making this passage about obedience I am going to make it about responding to the call. This can mean one’s initial response to Jesus, aka accepting salvation for the first time, but it can also be a daily response. Am I willing to drop something that I’m doing so I can follow Jesus and participate in “fishing” for people to join his Kingdom? I hope so, but there are many times when I don’t leave my “net” behind in favor of that higher purpose. When I do that, I am missing out and cheating myself, but because I have accepted Jesus’ initial call to salvation, this is where the obedience connection comes in. 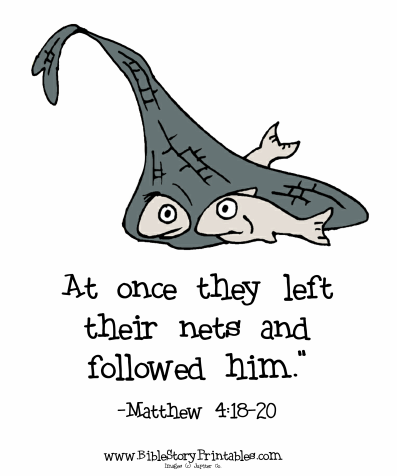 I have already said I want to follow Jesus, so when he calls me to put down my net, I need to listen and obey… “at once.” To disregard the call at this point is disobedience. Immediate obedience is a hard thing to do, but this passage encourages me to make it more about knowing the character of Jesus and responding because of who he is. If I’m finding it difficult to respond (obey), I’m seeing that I need to pay more attention and spend more time on discovering Jesus’ love for me. Something in his Spirit knows me, knows that I want to follow, and knows what I am capable of if I will only put down my net. He speaks to my heart as no one else can. What do you think about this passage? What thoughts or feelings do you experience when you read about Jesus’ call and the brothers’ response? I’m happy to spread the challenge around! Love you, Coral!